"You cannot buy loyalty; you cannot buy the devotion of hearts, minds, and souls. You have to earn these things." Snitker Goldens is a family-owned and operated breeding program striving for excellence and integrity in the rearing of Companion, Service, Emotional Support, and Therapy Dogs. Their focus is on the relationship and everything from breeding selections, puppy handling, training, and enrichment is based on this. They believe it to be the most important factor when imprinting puppies and raising their own Goldens. From humble beginnings to the professional program it is today, Snitker Goldens have been raising and breeding Golden Retrievers for nearly two decades. 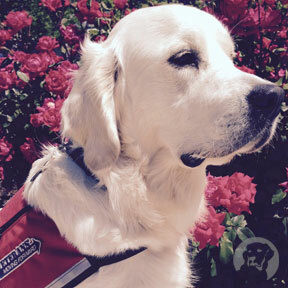 While focusing on breed standards as determined by the American Kennel Club and the Kennel Club, improving their lines in regards to health, conformation, titles, and temperament, the heart behind the Snitker Goldens breeding program is raising Golden Retrievers who are not only equipped to serve others, but given the opportunity to reach their individual potential to serve. The Imprint™ program was created to give puppies 0-8 weeks a solid base for families to build on. Parent selections are made with the intent to produce puppies with exceptional intelligence and working abilities and The Imprint™ program is used to develop these qualities in each puppy. Please visit The Imprint™ page to learn more about the protocols used in this specialized puppy enrichment program. Service Dog, Prince (pictured above). "We not only have the privilege of working with these incredible Golden Retrievers on a daily basis, we do it as a family. Our passion in the Golden Retriever is the relationship - whether that be as Companion, Service, Emotional Support, or Therapy dogs." Rhonda has lived with animals for over fifty years and began raising Golden Retrievers in 2001. As a professional artist with a master's degree in Art Therapy, much of Rhonda's skills and excellence in this area uniquely equip her with the tools and ability to nurture and raise an exceptional puppy. Though every puppy is different, just as in children, each Snitker Golden puppy raised in The Imprint™ program under Rhonda's watchful, guiding care, has the same desire to connect with their human handler. It is a resounding theme within her program: the relationship-centered approach to raising and training Goldens. Rhonda's primary role in overseeing Snitker Goldens is quality control, puppy health, and management during critical imprinting weeks (0-8) before puppies head home to their forever families. She also loves the artistry that goes into selecting future breeders for the program. Rhonda is passionate about the working Golden, focusing on continuing education to improve the Snitker Goldens team members' skills. She especially enjoys her beloved adult Goldens and watching them mature into her close companions. Fun Fact: Rhonda's first dog was not a Retriever, but instead, a Springer Spaniel, when she was a teenager. She ultimately fell in love with the Retriever when she and her husband brought home "Mandy" for their oldest son. Heath earned his master's degree in education and taught students in the public school for ten years before joining the Snitker Goldens Team in 2018. He now helps prepare Gold Select™ Pups and Gold Select™ Young Adults for a life of companionship and service with their families. Heath has often joked that one of the perks of his new job is not having to ask permission to use the bathroom and leave the classroom. He also says teaching and training are eerily similar! Heath is responsible for the immaculate grounds the Snitker Goldens sires and dams get to enjoy as well as the continuous work of sanitizing the facilities, allowing both puppies and adults to enjoy a clean and healthy environment. Heath is also a part of the Gold Select™ training program where pups earn their AKC S.T.A.R. Puppy Canine Good Citizenship, Canine Good Citizenship, and, for promising young breeders preparing to enter the Snitker Goldens program, their Therapy Dog certification. Heath's patient work with these Gold Select™ youngsters is invaluable as they grow and mature into lovely, relational adults. Fun Fact: Heath's first dog was an Old English Sheepdog, Teddy. While the nostalgia of childhood makes that memory a fond one, Heath would far prefer the grooming upkeep for a Golden Retriever! Like many who have grown up in the country, Stephanie spent her younger years raising quite a few different animals - and not just limited to the four legged kind! 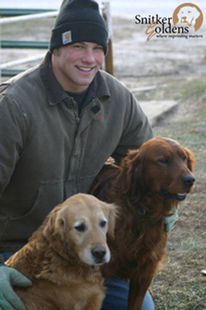 She and her husband, Heath, adopted "Sam" in 2008 and have enjoyed Golden Retrievers in their life together ever since. Stephanie earned her bachelor's degree with a focus in marketing and design. While her professional life included design work for photographers until she joined Snitker Goldens in 2010, Stephanie has always enjoyed working with animals. A good cup of coffee and a Golden to relax with is her idea of a good time. Stephanie is responsible for the majority of email and phone correspondence with families adopting Snitker Goldens. Her outgoing and warm personality is the first "face" you'll meet when you contact us. You can hear her passion about the work we do here, and how this work influences and impacts the lives of future Golden owners. She also heads up any design, photo contests, web design, or creative "stuff" in general, including much of the photographic work you see online. Her keen eye is the one that takes the images in an effort to give you an inside look at our everyday with the puppies and dogs. As a Gold Select™ Trainer, Stephanie enjoys learning from and applying the wisdom of world-renowned trainers like Suzanne Clothier. Fun Fact: Stephanie was an active member of 4-H as a young girl and she and her dog, Beau, competed in several local obedience competitions...they didn't always win first prize​, but they did have a great time. You may reach Stephanie at stephanie.snitkergoldens@gmail.com. Connect with Stephanie on Facebook. A boy and his dogs. A thirteen year-old boy pulls a small puppy out of a Christmas box, smiling the widest smile you can imagine. That was our oldest son and his girl, Mandy. A year later, Rusty joined the two of them. From these very humble beginnings of a little boy and his puppies, grew a love of Golden Retrievers and Snitker Goldens.